Ameeta and Sanjay Sinh have not visited the Bhupati Bhawan Palace in Amethi ever since Garima entered there on June 25. The infighting in the family of Amethi Maharaj and Congress MP Sanjay Sinh has taken a bitter turn with Anant Vikram Singh, his son from his first wife Garima Singh, declaring that he along with his mother and sisters are now ready to fight a legal battle with his father for “their rights”. The MP’s first wife and her children are also meeting public at the palace. Meanwhile, both Sanjay Sinh and his second wife Ameeta Sinh, former Congress MLA from Amethi, recently met senior officials of the state government to present their side of the case. 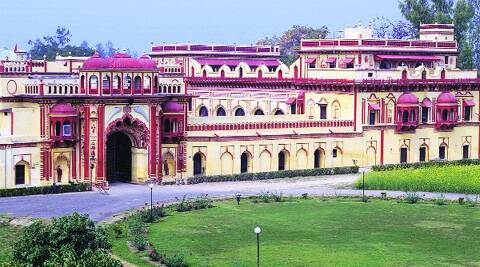 Ameeta and Sanjay Sinh have not visited the Bhupati Bhawan Palace in Amethi ever since Garima entered there on June 25. Garima and her children had earlier said that while Sanjay Sinh was welcome to visit the ancestral palace of which he is the “prime caretaker”, Ameeta would not be allowed. Sources in the government inform that Sanjay and Ameeta have sought help of the administration claiming that Anant Vikram along with others have made “forceful entry” into the palace and have no “rights over it”. Meanwhile, as the issue is yet to be settled, Garima, Anant Vikram and his sister Mahima have opened the gates of the palace for public meetings. While a specific time is set for Garima to meet public every morning and evening, Anant Vikram and his elder sister are meeting public during the day time. “This is what the traditional system of the palace has been… My mother also performed puja of the “kuldevi” as she used to in the past and have realised the there are golden “patras”, which are missing.” said Anant. He said, despite having equal right, there was “too much pressure building on us to leave the palace.” As allegations and counter-allegations continue, Sanjay and Ameeta have expressed “doubts over the intention” of Garima and her children shifting to the palace after a gap of 18 years. The couple had claimed to be giving Rs 1 lakh per month to Anant “to take care of his needs”.